Published by Mountainblog on 06/25/2015 . Expertly crafted to minimize bulk and maximize utility, our new 2L Merino Shell Jacket is the only one ever to be made in Reda Active® Merino Jersey & EVENT® DVL membrane, the lightest and breathable ever, able to ensure protection from rain and wind. 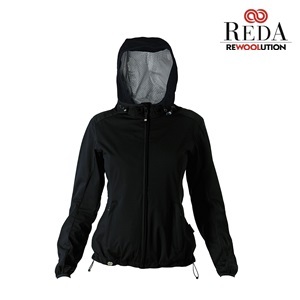 Ideal for hikers this style provides the most higher protection among Shell Jackets. – Rubberized logotype in relief. Available also in men’s collection. 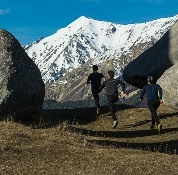 Rewoolution makes garments inspired by avant-garde : a line in pure Merino wool, completely free of synthetic fibres and designed for people who love doing sport in close contact with nature. The coming together of the great textile traditions of Italy, which are written into our wool mill’s DNA, and our ongoing technological innovations has given birth to a natural collection of fabrics with higher performance: a line that revolutionises the idea of wool, now no longer a fibre that itches but something softer, lighter, anti-bacterial, that eliminates odours and is highly breathable. Innovation, “green” sensibility and respect for our local craftsmanship heritage work for a more genuine “Made in Italy” concept. Rewoolution has “sewn together” the values of the past with those of the future. 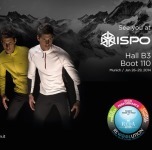 ISPO 2014: SportStyle, Merino Wool...Rewoolution!